A Year of Being Here: Thomas Merton: "When the Shoe Fits"
"When the Shoe Fits" by Thomas Merton. Text as published in In the Dark Before Dawn: New Selected Poems of Thomas Merton (New Directions, 2005), edited by Lynn R. Szabo. 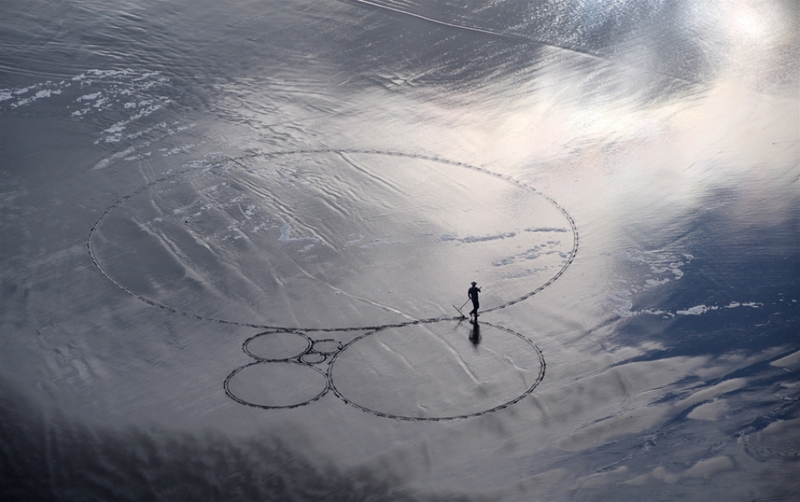 Art credit: Untitled image of California artist Jim Denevan executing a sand drawing. From the artist's website: "Jim Denevan creates temporary drawings on sand, earth, and ice that are eventually erased by waves and weather. These drawings range in scale from smaller beach compositions to large scale land works the size of a city." See more of his artworks here. This poem has brought me immeasurable comfort and peace during some difficult times. And it has let me focus in a very effective way when it was time to get to work. Thank you Thomas Merton, and also the friend who shared it with me years ago.